The weather is looking amazing for the Easter Monday Holiday and we have spaces available for our full day trip at the special price of $180.00 each. Join us for a 8+ Hour Fishing Trip this Monday from 7am till approx 4pm for just $180.00 each including all gear that's a saving of $40.00 and did we mention the weather is looking great! 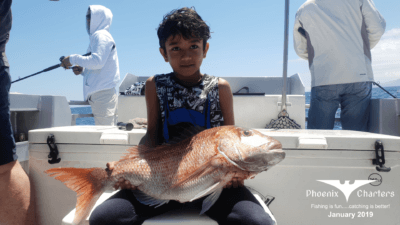 We'll be heading out past the wonderful Coromandel and towards Little Barrier or Great Barrier in search of some big snapper feeding under the workups. So don't miss your chance to join us just click the Book Now button to secure your spot. 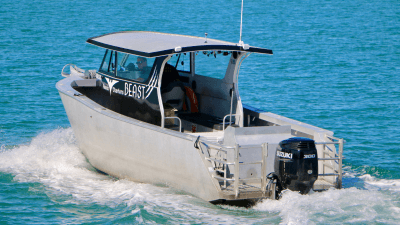 Phoenix Charters run the newest fishing charter boat in Auckland "Beast" which was purpose built for the Hauraki Gulf, it features seating for up to 9 passengers and comfortably accommodates 6 to 8 anglers with it's full walk-around layout. Phoenix Charters is owned and skippered by Brett Smith a keen fisherman who loves catching big fish. Brett has been running fishing charters in Auckland for over 5 years now and will take you to the fishing hot spots in the Hauraki Gulf. Our fishing trips from Auckland target mainly Snapper and Kingfish, but we often catch Kahawai, John Dory, Gurnard and Trevally while jig fishing. For extended trips we can target deep water species like Hapuka. Our pricing covers the fishing charter as well as all fishing equipment for the day. We have 6 hour options, over our summer fishing season and full day packages throughout the year. Or contact us for custom charters in Auckland. Want to know when the best day to go fishing is this week. Check out our Auckland Marine Weather forecast to see what the wind and wave heights are this week. Or get in contact with us and we can advise the best day. 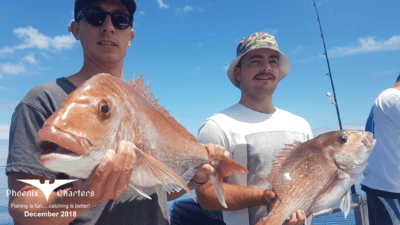 Want to go fishing but don't have enough mates to get a group together then join one of our individual fishing charter trips in Auckland from just $180 each for a full day including all gear. Book out the whole boat for a fishing charter from anywhere in Auckland for your group. We can provide fishing or cruising packages for groups up to 8 people from just $1300 for 6 hours. Want to give that special someone the ultimate gift. Then grab one of our full or half day fishing gift vouchers and they'll thank you for it. Have a look at some of our recent catches! Follow us on Facebook and Instagram and check out some of our previous clients catches. Click on our Latest Pics and you can follow us to get the latest offers.